A derelict home advertised by real estate agents as ‘the worst house you’ll ever see’ with a pool that looks like ‘a science experiment’ has hit the market for almost $1 million. The neglected two-bedroom home sits in a prime beachfront location, at 5 Harbour Parade in Buddina on the Sunshine Coast in Queensland, but is considered a definite ‘knock-down job’. Squatters and vandals have graffitied the walls with obscenities, the pool has been converted into a skate bowl and the home has a permanent ‘bend in the centre’. Gorman and Gray real estate agent Anthony Gorman decided to ‘have a bit of fun’ with the online advertisement for the property and refrained from tiptoeing around the obvious flaws, Domain reported. ‘There’s a bend in the house, the pool looks like a science experiment and it looks like it was decorated by Breaking Bad but it is the most magnificent block that you’ll find,’ he wrote. Photos of the derelict home show an overgrown backyard, smashed tiles on the stairwell and multiple cords and mattresses scattered on the floor. Despite its shortcomings, the property has two bedrooms, two bathrooms, two parking spots and sits on a 685 square metre block. But Mr Gorman said the new owners may want to start fresh. ‘After having some potential buyers walk through, who quickly ruled renovating out, it became apparent that this was definitely a knock-down job,’ Mr Gorman said. The agent said the neighbours would be overjoyed if the house were to be knocked down. The current owners are facing a loss of $650,000 due to the property being ignored for four years. They purchased the beachfront home in 2011 for $1.65 million. ‘It really needs a buyer willing to spend $2 million because of the building that would need to follow the sale of the land,’ Mr Gorman said. It is currently on the market for $990,000. THE gateway to Palmview’s $3b master-planned community of Harmony will become a reality on Monday. AVID Property Group and Sunshine Coast Council’s Cr Rick Baberowski will officially open Peter Crosby Way, the northern access into the 378ha project to the south of Sippy Downs. During the next 15 to 20 years Harmony will deliver more than 4800 homes for 12,000 future residents, all enhanced by 100ha of open space. Harmony is also slated for the future delivery of a town centre offering 15,250sq m gross floor area. AVID Property Group general manager Bruce Harper said the event would be a landmark day for development at Palmview. “This is an exciting construction milestone as we officially open Peter Crosby Way – the gateway to Harmony,” Mr Harper said. Sunshine Coast farmer Peter Crosby has been a land-owner since 1964 and has strong roots in the area. Crosby Hill Road at Buderim is named after the family. Mr Crosby has been operating a cattle farm on the land, and a cane farm in previous decades. The road opening coincides with the start of construction on individual houses at the estate. Work on display homes in the Harmony Display World is already well advanced with the 43 homes from a team of 25 national and local builder partners expected to open in the second half of this year. Harmony’s first home buyer Daniel Clark said he was looking forward to construction commencing on his new home. “It is very exciting to get out on site and see the construction progressing at Harmony,” Mr Clark said. “Having downsized to a smaller sized block will mean less time spent on maintenance and more time for the important things in life. “Harmony is the perfect location for me – right in the heart of the Sunshine Coast but also a short drive to Brisbane, meaning I can be close to both my daughters and grandchildren at Noosa and Albany Creek. “I love that my block is so private and there will be lots of green, open spaces in the community. Queensland home builders, Stylemaster Homes, is set to deliver Mr Clark’s new four-bedroom, open plan home. JOHN Hunt thought he would be sleeping on the streets this week. Mr Hunt has spent the past two months searching for a rental property after being told he would not be able to renew the lease at his Currimundi home. As if finding an affordable rental on the Sunshine Coast is not hard enough, his house hunt was made even more difficult because he needs a residence that is wheelchair accessible and can accommodate his two companion dogs. On the eve of eviction this week, he got a phone call that changed his Christmas. “I got a house – that’s Christmas taken care of for me,” he said. Mr Hunt will move this weekend to a rental at Beerwah which he can make wheelchair-friendly through the use of portable ramps. He had been forced to look for somewhere else to live because his landlord required his current house for use by a relative. He said he was fortunate that his letting agent, aware of his predicament, had allowed him enough leeway on vacating the property by the due date of Tuesday. “I would have been out on the street,” he said. On a disability pension, Mr Hunt is part of a group of people finding it increasingly difficult to rent on the Coast because their fixed incomes have not risen at the same rate as rents. Mr Hunt estimated he looked at 150 houses over two months, of which about 20 were suitable. He was critical of home owners and letting agents who seemed oblivious to the requirements of disabled potential tenants such as himself. “It’s not the housing crisis, it’s people with no common sense – people sending me out to houses with stairs and houses I can’t fit into in a wheelchair, bathrooms I can’t fit into,” he said. His house hunting gave him an insight into the shortage of affordable housing on the Sunshine Coast. “It’s just so scary. Some of the people I talked to were living in their cars. Something needs to be done. People need to know about it, I think,” he said. The property overlooks Sunshine Beach, as the backyard lawn meets the sand. A SUNSHINE Beach mansion sold for a cool $9.3 million has smashed a Queensland real estate record. The sale of the Webb Rd beachfront beauty now claims the highest property sale in the state outside of Brisbane. Noosa real estate agency Tom Offermann oversaw the multi-million dollar exchange and principal Tom Offerman said the 1460m2 property is worth every penny. “It’s a record price, but I think it’s worth every dollar when you consider it’s a once only payment for enjoyment in perpetuity, and the value will only escalate over time,” Mr Offermann said. “It really only hits you how wonderful the property is when standing on the lawn overlooking the surf. The five bedroom, four bathroom property overlooks a panaromic ocean view of Sunshine Beach, with a lush tropical backyard garden fringing a lagoon-style pool and a lawn that seamlessly meets the white sand. The home boasts “party-sized” balconies and terraces, open spacious interiors, and is a two-minute stroll to a shopping village and 4km to chic Hastings St.
Mr Offermann said the previous owners lived there since 1984, and have “downsized” from the property to another house in the same area. Mr Offermann would not comment on the buyer’s identity or intentions for the property, however did make note of the number of celebrities that often make Sunshine Beach their home. “One of the real joys of our business is the people we have the privilege to meet. It’s amazing who can walk into our offices: rock stars, movies stars, sports stars, corporate captains, celebrities, billionaires, you name it,” he said. “I remember one day we met the Incredible Hulk, Bill Bixby, in our office, and then bumped into Rod Stewart getting a sandwich next door. 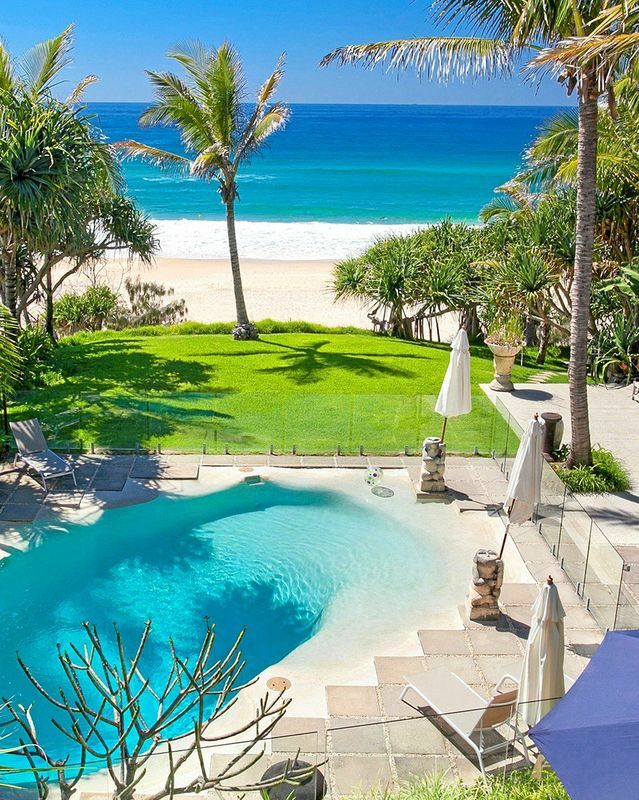 Tom Offermann handles most of the prestigious sales in Noosa and currently has seven of the eight available beachfront houses listed, starting at $5.95 million. Mr Offermann said he remembers overseeing the first million dollar sale for a Sunshine Beach property in the late 1980s. “I recall negotiating the first million dollar sale for a Sunshine Beach house in 1987 when a lot of people considered it a ridiculous price,” Mr Offermann said. “Demonstrating how the value of prime location, we sold it again a couple of years ago for over $7 million.